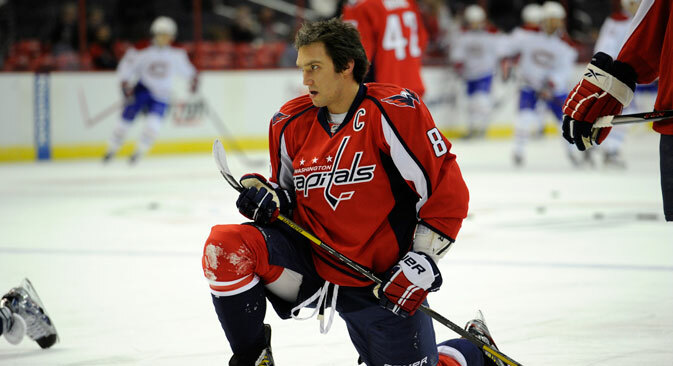 Washington, D.C. fans love longtime Caps player Ovechkin, and so does the entire world of hockey. Ovi is an ambassador to the Sochi Olympics and was a torchbearer this fall. Hockey fans wait to see which Russian stars will take the ice for the national team. Washington’s very own Russian talisman is riding high in the NHL scoring charts – and Alex Ovechkin is just one of a galaxy of stars from the East with designs on a glory season on both sides of the Atlantic. “Ovi,” as he is known, had a short rest in October after a shoulder injury from crashing into the goalie and net in a recent loss to Vancouver’s Canucks. But he says he is getting ready for a winning streak. With the hockey world eagerly anticipating the latest ‘best-of-the-best’ showdown at the Sochi Olympics come February, the Russian regiments in North America know that it’s time to put up or shut up if they want to join the Russian assault on a much sought-after Olympic gold. Hockey fans around the world are coming up with their own fantasy team of Russians for Sochi. Ovi, one of the guys who was most vocal in calling for a deal to enable the NHL’s top names to suit up at the Olympic Games, responded to that challenge with a blistering start to the season. Ten goals in his first 10 appearances, coming off the back of a huge 23-in-23 scoring streak, has got pundits talking about a possible record-breaking season for the Caps. Meanwhile, back in Russia, there’s hope that he’s ready to bring his A-game to the national team and cement his poster-boy status by firing the Red Machine to the biggest prize in the sport. The big question, therefore, is not whether he’ll play, but where: Team Russia likes the look of Ovechkin on the left; Caps’ coach Adam Oates doesn’t want him distracted from right-wing duties. If Ovechkin and his big-name colleagues on offense, Evgeni Malkin and Pavel Datsyuk, are among the first names on Zinetula Bilyaletdinov’s roster, there’s still an intriguing battle for Sochi spots being fought out across North America this fall. Former Capitals’ backstop Semyon Varlamov was looking impressive in Colorado until his recent arrest and published interviews with his girlfriend in the Denver Post describing drunken assaults. His .945 save percentage at the end of October was fourth best in the competition and placed him among the early favorites for the Vezina Trophy, but all that may be at risk now. At press time it was not clear where the scandal might be headed. Previously, fans had seen a huge turnaround from last season, where his NHL numbers were disappointing and he faced heavy criticism back home as Russia crashed at the World Championships. Defense was another Russian problem in Helsinki back in May. That was partly explained by the play-off commitments of the likes of Montreal’s Andrei Markov and the ever-reliable LA Kings’ play-off star Vyacheslav Voinov, both of whom look to be locks for Sochi. Voinov, in particular, offers a thunderous right-handed shot from the blue-line and is likely to be inked in for the powerplay for both club and country. Russian observers are also following Anton Belov’s progress closely after his move from Avangard Omsk to the Edmonton Oilers. Belov’s uncompromising style has led to controversy in his homeland, not least following an incident where he appeared to kick out at the prone Evgeni Kuznetsov – a Caps prospect for the future – during a play-off game two seasons back. In Canada, Belov made a solid start in a roster heavily criticized for weak defense; back in Siberia Avangard’s back line has all but evaporated in his absence. Belov isn’t the only Russian hoping to use Edmonton as a springboard toward Sochi, but charismatic youngster Nail Yakupov faces a big ask to force his way into the national team reckoning in the coming months. If the defense is sometimes questionable, the offense has talent to burn. Datsyuk might be a veteran, but is some pundit’s pick for the NHL’s best player right now; Malkin was devastating at the 2012 World Championships and stands up under the weight of massive expectations. Russian hockey team once again an Olympic dark horse? Siberian hot-shot Vladimir Tarasenko can only grow in stature as he tackles the day-to-day demands of the NHL at Saint Louis. Back in Russia, one Ilya Kovalchuk is the KHL’s biggest box-office draw after returning to SKA St. Petersburg, while young Kuznetsov has played his way into Bilyaletdinov’s plans … and the list goes on. Yakupov, a charismatic young forward and graduate of the Nizhnekamsk organization, has all the potential to become a huge star. It’s not just the off-ice charm that generates excitement and glamour, there’s also the small matter of a dangerous and skillful game to back up the swagger. But for now he’s an enigmatic combination of highlight-reel moments delivered too sporadically to generate real substance.His transformation to the big time was stalled by last season’s lock-out and an unscheduled return to his native Tatarstan, but he grabbed 31 points in 48 Oilers game, enough to suggest he can make the step up. The question is whether he can do it in time for 2014.